Bloom/Leighton Duo audio. Hover on the arrow below until it turns blue, and then click to play. ​Peter H. Bloom, flute, acclaimed as both a classical and jazz artist, concertizes in the United States, Canada, Europe, Asia, Australia and New Zealand and is featured on 40 recordings (Sony Classical, Dorian, Leo, 9Winds, other labels). The Boston Globe called his playing “a revelation for unforced sweetness and strength,” while Jazz Improv praised his “exquisite melody” and ArtsFuse wrote, “His solos on flute and amplified flute are always highlights of a performance.” His career in jazz encompasses free improvisation, jazz standards, blues, bebop and the avant-garde. He has appeared with jazz luminaries Charles Neville, Jaki Byard, Sheila Jordan, Geri Allen, Walter Thompson, Raj Mehta, and Mark Harvey. A 38-year veteran with The Aardvark Jazz Orchestra, Bloom appears on 13 Aardvark CDs, including 7 discs on Leo Records. 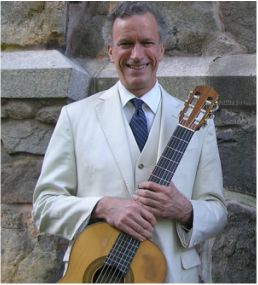 Mark Leighton is a classical and jazz guitarist known for his superb artistry and wide-ranging repertoire. He has performed as a solo recitalist and ensemble player across the Northeast. He is a regular member of Copley Chamber Players and has appeared with jazz notables Billy Novick, Larry Carsman and Ted Powers, to name a few. Mark Leighton serves on the Applied Music Faculty at Colby College, and teaches at Eastern Nazarene College and St. George’s School. ​ ​A graduate of the New England Conservatory of Music, Mr. Leighton studied with noted guitarists Robert Sullivan, David Leisner and Sharon Isbin, among others. Guest artists who join Bloom and Leighton include pianist Tim Ray and bassist Dave Zox. Tim Ray’s wide-ranging skills as a soloist and accompanist have afforded him the opportunity to perform with legendary performers from all walks of music. Perhaps best known as long-time pianist for Lyle Lovett, Tim appears on more than 70 recordings and has performed with an extensive list of pop music icons, notably Aretha Franklin, Bonnie Raitt, Jane Siberry and Soul Asylum. He regularly performs with jazz greats like Gary Burton, Esperanza Spalding, Phil Woods, Scott Hamilton, and Dave Douglas, and his classical credits include concerts with Gunther Schuller, the Boston Pops, the Boston Modern Orchestra Project and others. He tours frequently in the Americas, Canada, Mexico, Europe, Asia, and the Middle East; has performed at Carnegie Hall, the White House, the Kennedy Center, and the 1992 Presidential Inauguration; and has made repeat appearances on “The Tonight Show” (Johnny Carson, Jay Leno), “Late Night with David Letterman,” “The Conan O’Brien Show,” and other national broadcasts. He is a faculty member of Berklee College of Music. Tim Ray has been called “superb” (The Wire, UK), “brilliant” (Jazz Journal International), and a “genius at the keyboard” (Musician Magazine). ​Bassist Dave Zox has been performing and teaching throughout New England since 1980. He has performed in concert with internationally renowned musicians such as John Abercrombie, Garrison Fewell, Sheila Jordan, Jim McNeely, Kenny Werner, and Phil Woods, and also played with the Glenn Miller Orchestra, the Artie Shaw Band, Herb Reed and the Platters, and other illustrious groups. As well, he performs chamber music for the First Parish Church in Concord MA. Dave Zox appears regularly in the Boston area with the Al Vega Trio, pianists Ray Santisi and Harvey Diamond and many others. He serves on the faculties of Northeastern University, Phillips Academy in Andover, MA and Ipswich Public Schools. He earned a master’s degree in Jazz Studies from New England Conservatory. Photos: Erlyn Ordinario, Matt Samolis, Heloise Tanglewood, courtesy Tim Ray, Dave Zox. Videographer: Mark Crosby. Video editing: Mark Gardner.